With the opening of the M40 extension in 1990 from junction 8 – linking with the M42 near Birmingham – much of the route was downgraded in importance. The sections between Bicester and the M42 near Solihull were classified A4141, A4177 and B4100. The section to Tring was finally built in the early 1990s, although to a lower standard and only from the M25 junction 20. There were two sections - the 7-mile (11 km) £23.9m Berkhamsted bypass, opened September 1993 and the 5-mile (8 km) £32.7m Kings Langley bypass, opened August 1993. 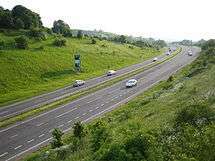 On 3 October 2003, the dual carriageway section was extended to the 3-mile (4.8 km) £25m Aston Clinton Bypass, which was originally intended to be built at the same time as the two sections further south. It enters Buckinghamshire and the district of Aylesbury Vale. It crosses the Grand Union Canal, and there is a junction with the B489, and finishes at a roundabout, becoming Aston Clinton Road. The road goes straight through Aylesbury, which is a bottleneck. It meets the A4157 at a roundabout as Tring Road, and the next roundabout is near Aylesbury Grammar School and a Tesco. It meets the A418 ring-road and becomes Exchange Street, then meets the A413 from Wendover at a roundabout and becomes Friarage Road, passing close to a Morrisons and the railway station. The A418 lefts to the left and it becomes Gatehouse Road, then at the next roundabout, it leaves to left as Bicester Road near the Texaco Aylesbury Service Station. After four roundabouts, it crosses the River Thame. It then meets a roundabout with access for the new Berryfields development as well as Aylesbury Vale Parkway before passing under a railway line, then through Waddesdon, then passes close to Westcott near the former airfield of RAF Westcott. At Kingswood, it passes the Crooked Billet (now the "Akeman Inn") and Plough and Anchor (now an Italian restaurant) pubs. It enters Oxfordshire and the district of Cherwell, and at Blackthorn it crosses the River Ray and meets a low bridge which was originally a 14-foot (4.3 m) limit but due to bridge strikes, the road was lowered and the bridge now has a 15-foot (4.6 m) limit. The £5.7m 2-mile (3.2 km) first stage of the Bicester bypass opened in November 1990, with the 2-mile (3.2 km) £3.9m second stage (part of the A421 section to Wendlebury) opened in May 1993, and has many roundabouts. Since 1993, the road now heads south-west where it officially becomes part of the M40 at junction 9, meeting with the A34 (which also overlaps the M40 to Birmingham - to draw traffic off the previous routes). The former route went through Warwick. From here to the M42, the original route is now mainly designated as the B4100 (multiplexing at points with the current A361 and A422 through Banbury, plus the A452 and A425 approaching and through Warwick) followed by the A4177 and A4141, the latter two both excellent wide roads. At junction 5 of the M42, the A41 follows its old course. Further north, the road bypasses Solihull and goes through the city centres of Birmingham and Wolverhampton. This renumbering took place in 1991. The A4141 and B4100 are new designations, while the A4177 is an extension of an existing route. Now as an A road, the road manifests from the junction (opened in November 1976) with the A4141 and M42 near Berry Hall Farm (Picture), and crosses the River Blythe and bypasses Solihull. The former route through Solihull is now the B4025 and B425, which passes Solihull School. The A41 has a staggered junction with the B4102 (for Solihull and Catherine-de-Barnes) near the BUPA Parkway Hospital. At Lode Heath, there is crossroads with the B425 (for Solihull Hospital) where the road is the Seven Star Road. The A41 resumes the old route at another junction with the B425, becoming Warwick Road, which is the name of the route all the way into Birmingham. At Worlds End there is the Shell Solihull garage on the left. Next is Ulverley Green and it passes the BP Mereside garage on the right and passes under the Chiltern Main Line (for Leamington) near Olton station, Olton Library and Olton Reservoir. At the junction with the B4514, there is a Tesco petrol station and the road enters the city of Birmingham. The B4514 leads onto Olton Boulevard and can be used to bypass Acocks Green, although there is one section to be completed near Sparkhill. It passes Archbishop Ilsey RC School at Acocks Green, then meets the B4146 and B4217 at a roundabout near a Sainsburys. It meets the A4040 ring road at a staggered junction and crosses the Birmingham -Stratford Line near Tyseley station and the Tyseley Locomotive Works. At Sparkhill, it crosses the River Cole and meets the B4145 at a roundabout near Golden Hillock School. At Sparkbrook, it meets the A34 Stratford Road and there is a crossroads with the A4540 and B4126. The two main routes overlap around central Birmingham and meet the A4540 Middleway inner ring road. The former route of the A41 through inner Birmingham is now the B4100 heading past the Digbeth National Express coach station, and passes near St Chad's RC Cathedral. The A41 resumes at Constitution Hill near Snow Hill train station, passing through Hockley where it meets the northern section of the A4540. There is a staggered junction with the A4040 as the road passes through Handsworth (at this point known as Soho Road) which is a particular bottleneck with narrow lanes, on-street parking, bad drivers and several close-set junction, often very badly congested. Just before The Hawthorns football stadium, home of West Bromwich Albion F.C., it leaves Birmingham and enters the borough of Sandwell. It meets the M5 at junction 1, where it also meets the A4168. The new route opened in 1995 and is called the Black Country New Road, and crosses the Midland Metro tram near Guns Village. There is a roundabout with the B4149 at Swan Village. From the roundabout with the A461 (for Dudley) at Great Bridge, it overlaps the A461 (to Walsall), crosses the Tame Valley Canal, meets the A4037 at a roundabout and goes under the Midland Metro near Wednesbury Parkway station. The A461 heads off to junction 9 of the M6 & Walsall. The A41 follows the old route from the next roundabout and enters the borough of Walsall. At the junction with the A4444 (the final phase of the Black Country New Road) it crosses the Walsall Canal. There are junctions with the A4098 (where the road enters the borough of Wolverhampton) and B4163. The road goes straight through the middle of Bilston, where it meets the dual-carriageway A463 Black Country Route at a busy roundabout. Close by is the Bilston Central station, near Morrisons. 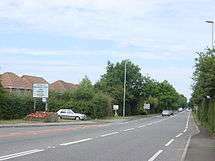 There is a junction with the B4484 (for the A454) near The Crescent station. At Priestfield, it meets the B4162, and passes the City of Wolverhampton College Wellington Road Campus (Bilston) near Priestfield station. From here, the Midland Metro runs down the centre of the road. There is a roundabout with the A4126 and the road passes under the Wolverhampton loop of the West Coast Main Line at Monmore Green, and crosses the Birmingham Canal. It overlaps the A4150 Wolverhampton Ring Road, then passes West Park Hospital and crosses the Staffordshire & Worcestershire Canal. It passes through Tettenhall, past Tettenhall College. 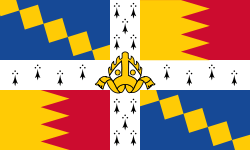 It leaves the borough of Wolverhampton near Wergs where it crosses the River Penk. It passes Wrottesley Hall, where there is a golf course. There is a junction with the A464 (for Shifnal), and the road enters Shropshire. It crosses the Wolverhampton to Shrewsbury Line on the Albrighton bypass. The Monarch's Way crosses and the road passes close to the RAF Museum at Cosford (through the middle of the RAF base). There is the M54 junction 3 and the road passes through Tong, and is crossed by the Monarch's Way. Close by to the east is one of the sites of the V Festival at Weston Park. The road meets the A5 at a roundabout, which is on the border with Staffordshire. At Weston Heath, there is a junction with the B5314. At the junction of the B4379, the road enters Telford and Wrekin. Nearby is Woodcote Hall (now a nursing home). The 5-mile (8.0 km) £6m Newport bypass opened in early 1985. The former route went through Chetwynd Aston. Newport is home of the Harper Adams agricultural college, at Edgmond. The road meets the A518 (for Telford) at a roundabout. There is another roundabout with the A518 for the eastern direction (which passes nearby Aqualate Park). There is a roundabout with the A519 and B5062 (for Whitchurch). The road rejoins the old route and passes Chetwynd Park. The £1.5m Hinstock Bypass opened in late 1983 It then passes through Standford, Standford Bridge and over the River Meese. It passes High Heath, Shakeford, Crickmery which is near Wistanswick. Nearby is the a former wartime fighter base RAF Ternhill, now an army base known as Clive Barracks. The road crosses the River Tern, meets the A53 at a roundabout at Ternhill. After Bletchley Manor, there is 3 miles (4.8 km) of dual carriageway. The road passes through Prees Higher Heath near a former airfield (RAF Tilstock), and meets the A49 at a roundabout near Tilstock. The 3-mile (4.8 km) £13.7m Whitchurch Bypass opened in July 1992, where the road meets the A49. The road then passes a junction with the A554 near Hamilton Square railway station, terminating at the bus station at Woodside. The end of the road offers spectacular views over the Mersey to Liverpool and transport links to Mersey Ferry services. The original (1923) route of the A41 was Stanmore to Oakengates, meeting the A5 at both ends. The A41 was subsequently extended at both ends. The northern extension dates from 1935. In Shropshire, the A41 swapped places with the A464 and the A529; the original A464 ran from Kingswood Common to Nantwich, and the original A529 ran from Hinstock to Chester. North of Chester, the A41 replaced part of the A51. The southern extension dates from after the Second World War. Watford Way was opened in about 1930 as the A5088. In 1935, it was renumbered A500, and it later became the A41. ↑ Speak now if you want a bypass by Hartley-Parkinson The Bucks Herald, 21 March 2007. Accessed January 2009. 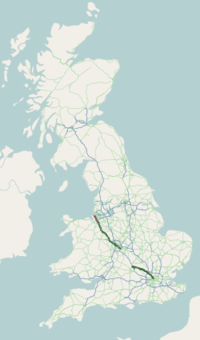 Wikimedia Commons has media related to A41 road.